One of the most intriguing announcements at Book Expo 2014 was about Goodreads’ new “Ask the Author” feature. If you’re signed up as an author on Goodreads, you can now host your own Q&A sessions, thus making new connections with your readers. Goodreads beta-tested the program with 54 well-known authors, including James Patterson, Dan Brown, Margaret Atwood, Khaled Hosseini and Isabel Allende. Now they’re opening up the feature to all authors. • Set expectations early: Tell your readers which topics you’ll answer and when. Don’t feel as though you have to answer every question every day. • Choose the questions you want to answer carefully, and post legitimate answers to them. You have control over which questions you want to show up on your page. Choose questions whose answers you’re happy to feature on your profile. • Participate in the Goodreads reader community. Ask questions of other authors and review their books. You don’t have to give star ratings to every book you discuss. Just be thoughtful. Sometimes showing up with a thoughtful comment on another author’s page inspires interest in your own work. 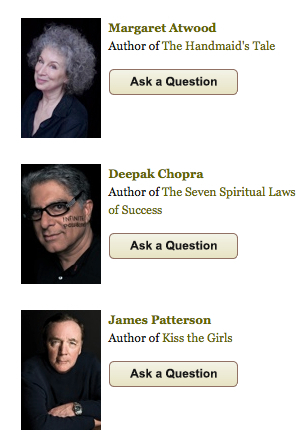 Check out the list of bestselling authors already answering questions on Goodreads. Very impressive. Filed under: book marketing - Goodreads - indie publishing - online promotion - promotion.